Usually, when someone mentions “insects” or “bugs,” you can hear a resounding “eeeeww” from the audience. Insects are often thought of as creepy-crawlies, monsters, the stuff of nightmares, etc. Why is that? As a child, I was constantly playing in the mud. I was interested in all the creatures the Earth had to offer, no matter how many legs they had. However, a few years ago I suddenly noticed that I no longer had the same appreciation for insects. I, too, developed an aversion to bugs! I decided to dig into my past and try and find the turning point. There wasn’t any. Years of being too busy to spend time outside, lack of knowledge on the creatures I used to love, and the general society’s “ew” had eventually turned me. So, I began to work with insects. I quickly found myself returning to my old self. I no longer felt uncomfortable seeing all of them at work. My interest in insects was reignited, and I hope to do the same for others. This brings me to the Museum of Biological Diversity’s 2018 Open House. 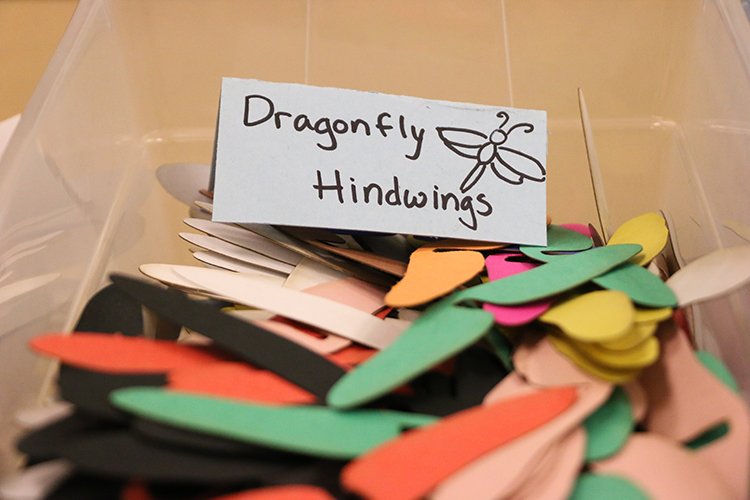 I was asked to come up with a bug-related interactive activity for the Triplehorn Insect Collection. I decided to try and create a station where visitors could put together their own insects. The bugs had to be simple enough to appeal to young children, yet aesthetic and elegant enough to attract the interest of an older audience. I settled on creating two designs, a butterfly and a dragonfly. 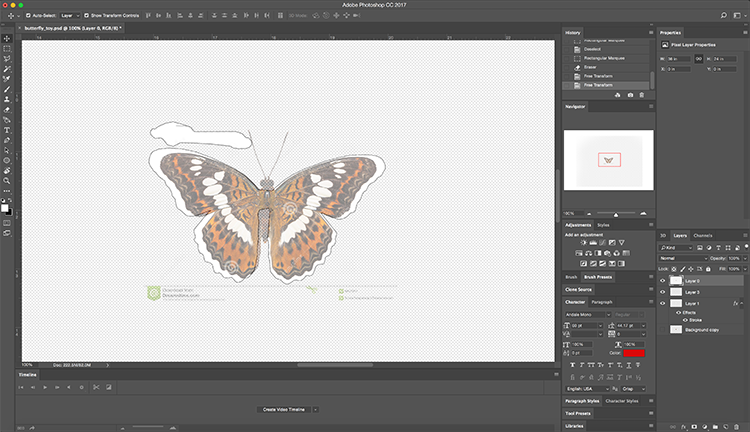 Using source images, I made an outline of the dorsal view of each of the insect’s wings, and a lateral view of their bodies in Adobe Photoshop. The butterfly consisted of two parts, and the dragonfly of three. 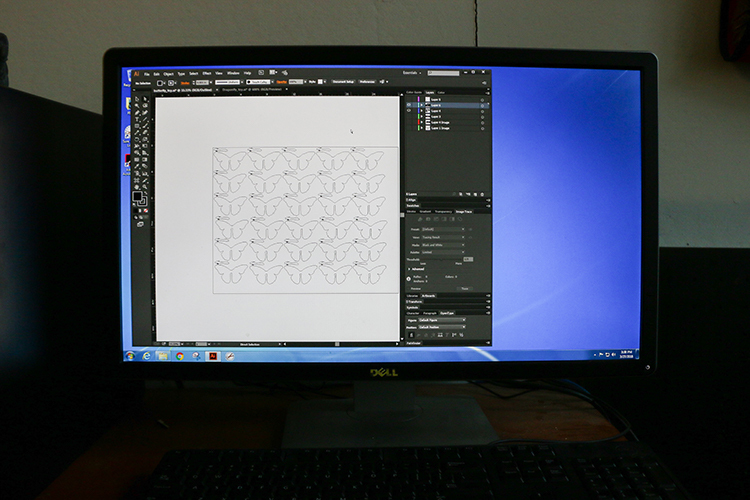 Creating the butterfly silhouette in Adobe Photoshop. Then, I converted the outlines into vector images in Adobe Illustrator, and multiplied it to fill an entire page. 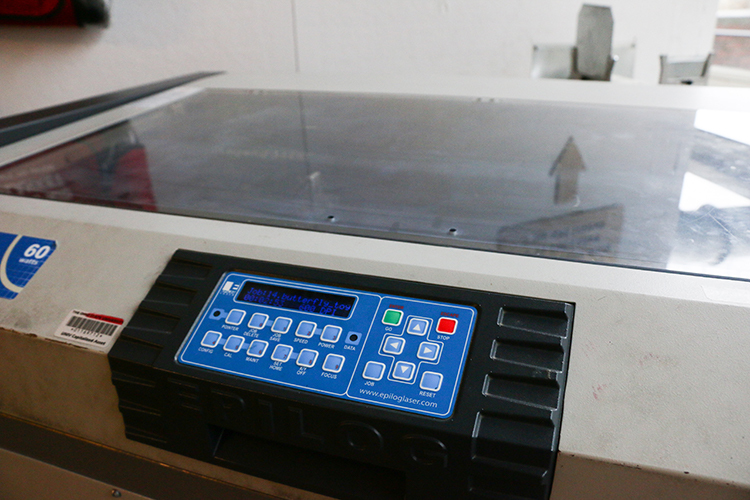 Getting the design ready for the laser cutter using Adobe Illustrator. After trying different materials, I settled on using 6-ply Railroad Poster Board. 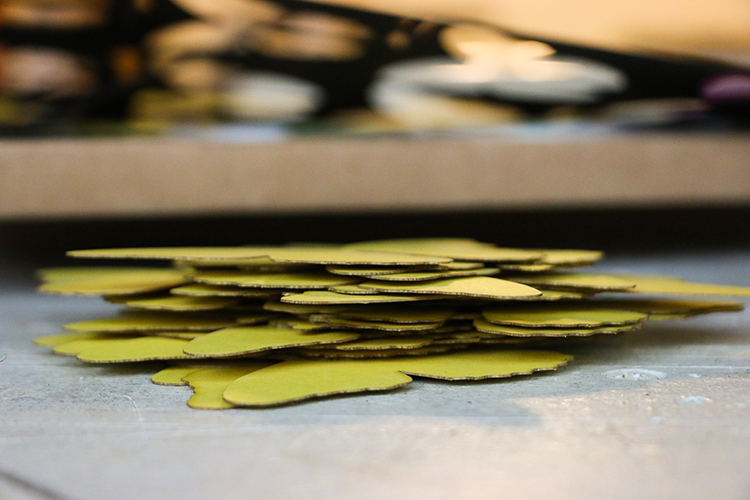 It is strong enough to have structural integrity, while being thin enough to not sacrifice the delicate design. 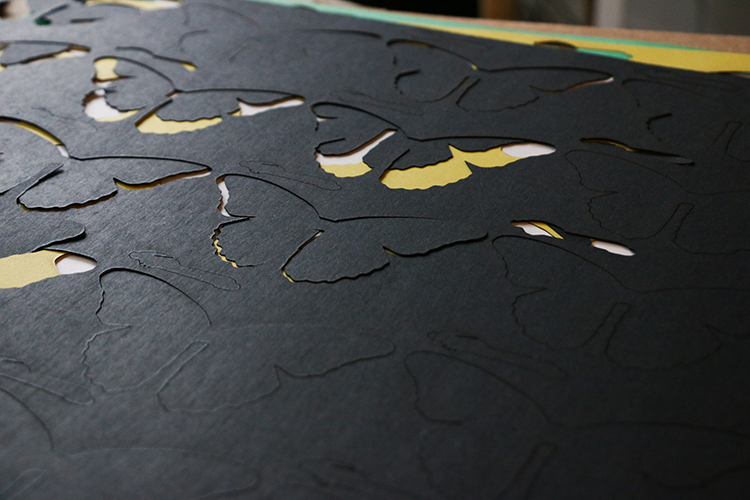 I used an Epilog Laser to cut out the pieces, which covered over 25 pages of 24 in x 36 in poster board. 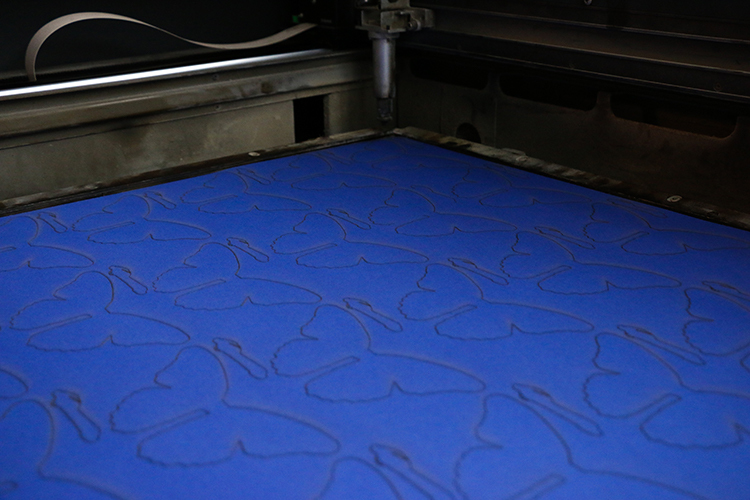 Blue butterfly parts after being laser cut. 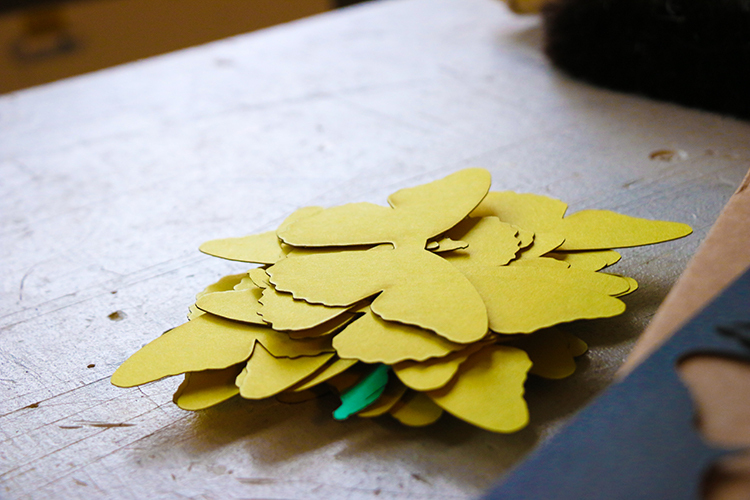 A stack of newly cut yellow butterfly parts. 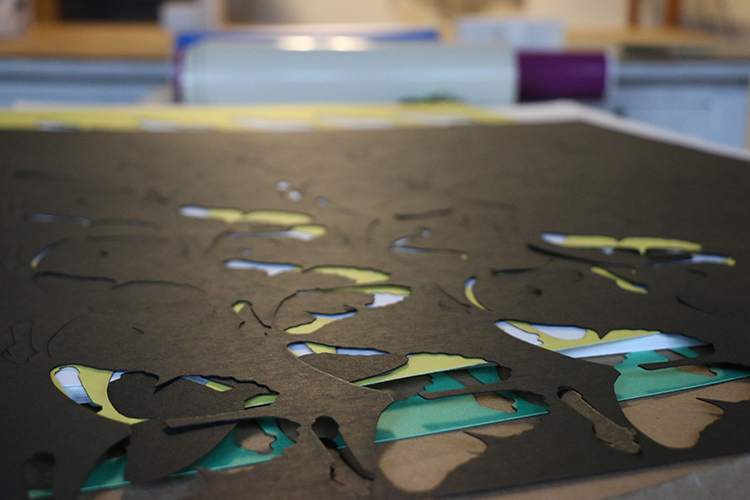 Removing the cut pieces leaves a stencil in the original paper! 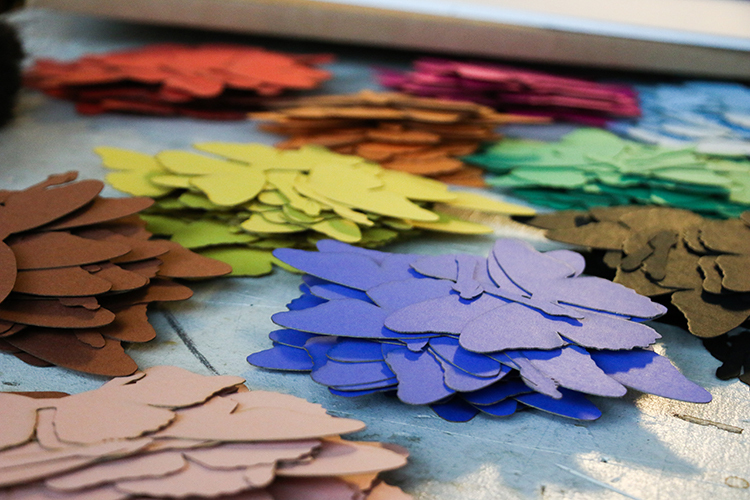 The sheets of paper turned into stacks of colorful butterflies and dragonflies. 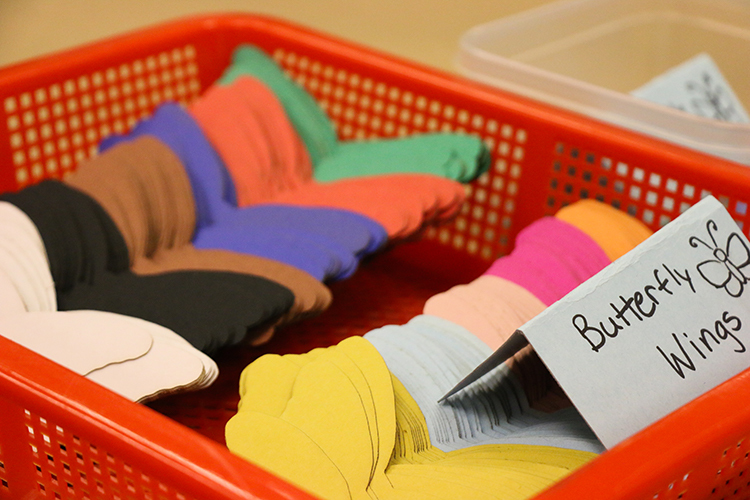 The pieces were then separated by type and labeled accordingly. The activity laid out and ready for the Open House to start! During the Open House, the activity was a huge success! (I was there as a volunteer!) Both children and adults took the time to complete the activity. Many children even drew their own designs on their insects. 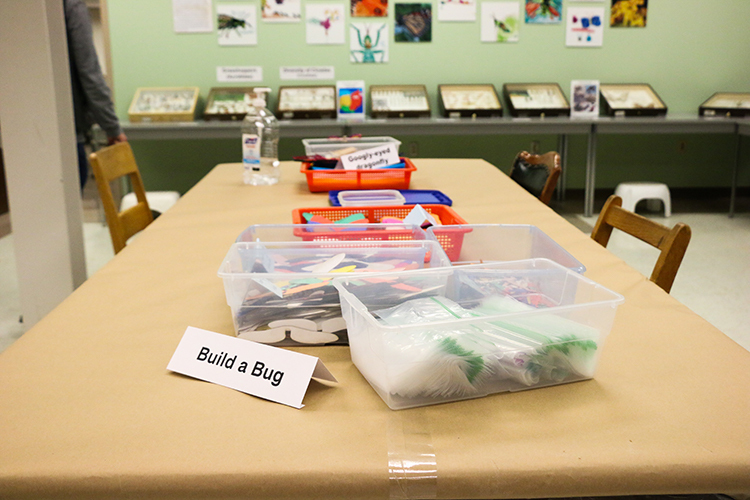 I noticed a lot of the adults that tried to assemble the bugs initially did it wrong. I hope that by having to start again, they had the opportunity to think about the different parts of the insect they were trying to assemble and by doing so developed a new appreciation for the insects. 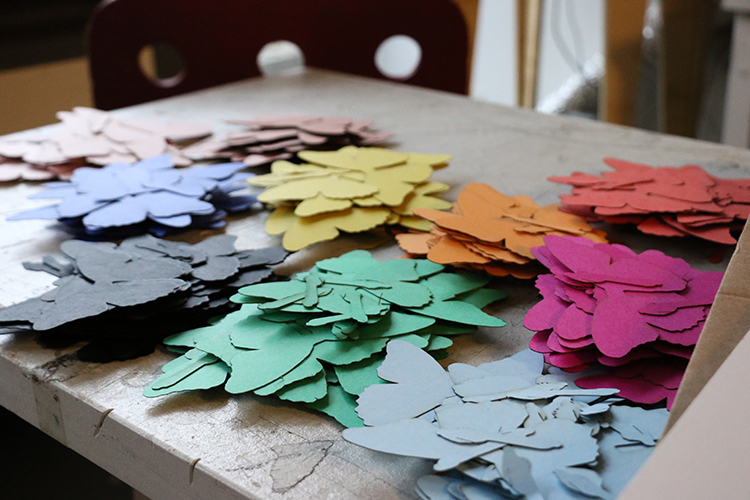 My model bugs also had holes lightly cut into their bodies, allowing for the addition of legs. 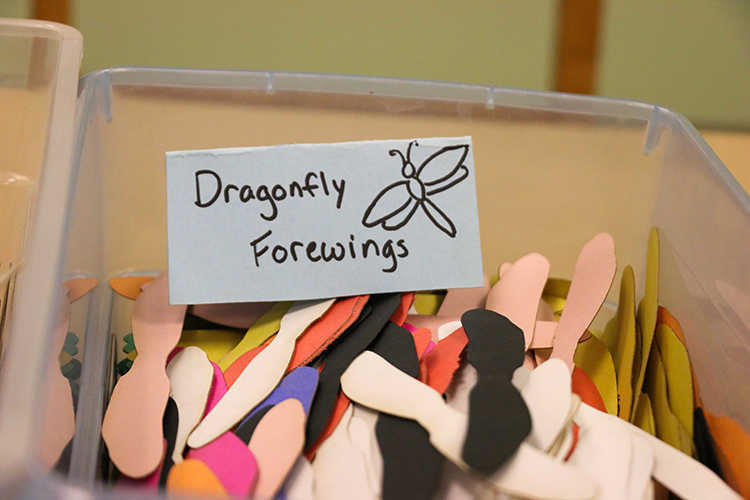 During the event we borrowed colorful pipe cleaners from another activity in the collection (Googly-Eyed Dragonfly) to make the legs of our insects. 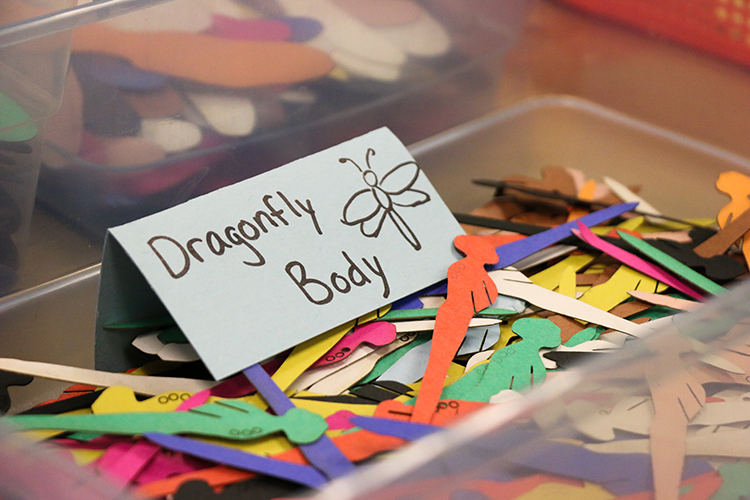 A child puts together a dragonfly with pipe cleaner legs. 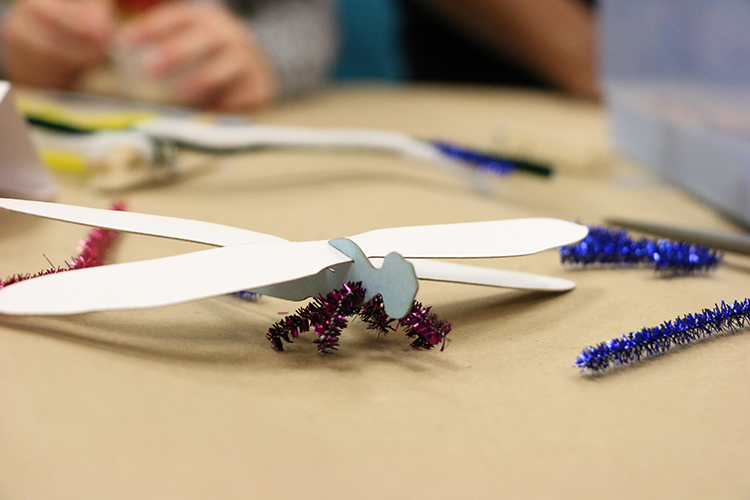 Borrowed pipe cleaners from the Googly-Eyed Dragonfly activity, people were able to create insects with bendy legs! The bugs were then put in little bags so that the children could reassemble the insects at home without losing any parts. I hope that activities like this will help the younger generations continue to be fascinated and appreciative of the world around them. Hopefully, if the younger generations grow up with a sense of wonder about insects, the commonly found disgust of them will eventually fade away. About the Author: Tamara Sabbagh is an artist that recently earned her Bachelor of Fine Arts, with a specialization in Art & Technology, from The Ohio State University. She currently works at the Triplehorn Insect Collection as an Undergraduate Curatorial Assistant. Contact Tamara and see her other projects through her website. 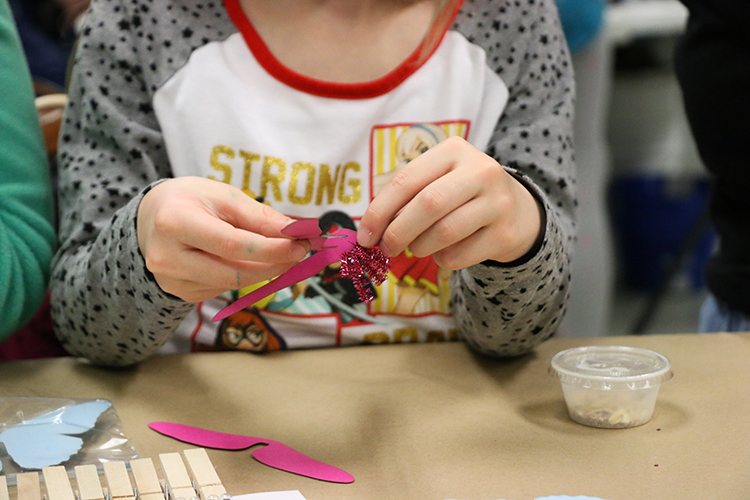 Posted by sabbagh.9 at 8:00am May 24, 2018 Posted in Education, Events & Outreach, General Knowledge, Insect Diversity, Museum Open House, Undergraduate Education and tagged activity, art, bugs, butterfly, dragonfly, insects, kid-friendly, laser cut. Bookmark the permalink.